The Central Works Council (in Dutch: Centrale Ondernemingsraad, COR) represents all employees in discussions with the management. The works council advises the management and in some cases has the right to allow/forbid certain policies or plans that affect the position of employees or the organization. Because FOM has become NWO-I as of 1 January 2017, there are changes in the way that the formal (central) employee participation is organized. In 2017 a new (preliminary) COR NWO started. All organisational NWO-parts have a seat in the council. Elections were organized in May 2017 and in June a new COR NWO has started. Go to COR-members to see the composition of the COR NWO and the representatives. In 2018 the COR meets every every four weeks and there is a meeting together with the management. Meeting dates are listed under 'More Information'. In the Inside NWO-I of March you can read all about the Central Works Council elections on 8 April and a survey that the Central Works Council recently held among NWO employees about “Unequal treatment” compared to colleagues at the universities and NWO-I. Also meet COR NWO member Arno Gregoor, project auditor at NWO Institute ASTRON in Dwingeloo. In the January edition of the newsletter Inside NWO-I (click here to see the full newsletter) you can read all about the upcoming Central Works Council elections and two themes the council is working on: the privacy legislation GDPR and the Implementation Regulations. We also introduce COR NWO member Frank van Amerongen, head of the Department of Mechanical Engineering at NWO Institute DIFFER. The COR has handed over its vision to the Executive Board on the central courses for NWO-I PhD students and postdocs. The COR believes it to be important that changes to the current course offer result from a clear vision on the training of young scientists and are not implemented ad hoc. The COR would like to see that the PhD's from the various NWO-I Institutes and the NWO-I PhD's have the same opportunities when it comes to training, especially when it comes to soft skills and career orientation. After all, as NWO-I is one employer, all NWO-I PhD students and postdocs must be treated equally and the central programmes must be accessible to all. [17 April 2018] See the NWO Central Works Council film and download the annual review 2017! [5 April 2018] The COR NWO Annual Review 2017 is available now. The document can be downloaden on this webpage. Since 1 January 2018, all employees of NWO-D and NWO-I have the same reimbursements and other benefits. The Implementation Regulations of NWO, NWO-I, CWI and NIOZ have been harmonized into one new set of Implementation regulations. The COR considers this an important step in the transition to a new NWO. In the autumn of 2017, a COR-delegation negotiated with a delegation of the employers. At the end of December, the COR approved the negotiation result. In the new NWO-UVR, most colleagues benefit. The COR has been able to agree on a good transitional arrangement for colleagues who will financially deteriorate. Individual negative financial consequences are gradually reduced over a period of eight years. For further details please check the attachment listed under 'More Information'. The Central Works Council (COR NWO) is following the merger developments closely. ASTRON, CWI, NIOZ, NSCR and SRON will merge with NWO-I with effect from 1 January 2018. COR NWO has repeatedly insisted on clear information for the staff of these institutes. A list of Frequently Asked Questions (FAQs) has now been drawn up and made available on the website www.nwo-i.nl. In October, COR NWO approved a training programme for managers throughout NWO. The programme is intended to contribute to a common leadership style and the creation of a shared new NWO culture (a single NWO). COR NWO considers this a good idea. Following questions from COR NWO, the executive board has promised to evaluate the programme after a year. COR NWO has recommended that the objectives be formulated in a clear and measurable manner. It would also like NWO-I to contribute sufficiently to the creation of a new NWO culture. 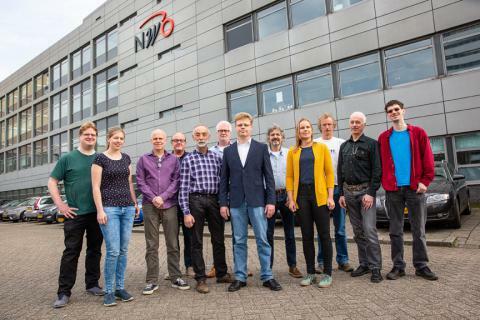 At the end of July, the COR delivered an opinion on the organization adjustment of NWO-I, due to the legal merger of ASTRON, SRON, NSCR, CWI and NIOZ with NWO-I. The COR has concluded that the impact on employee service tasks is low and has no objection to the adjustments. However, the COR has expressed concern about the increasing workload for employees and recommends measures. The COR has also advised to communicate with employees in an early stage about changes and support. 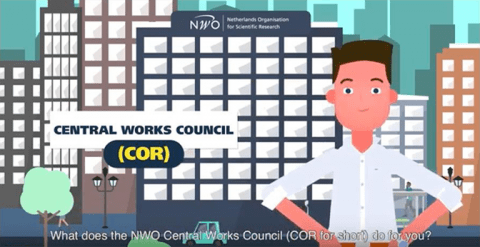 On 13 June the COR sent an advice to the NWO Governing Board on the legal merger of the Institutes ASTRON, SRON, NSCR, CWI and NIOZ with NWO-I. The COR believes that the formation of one foundation may have added value to all parties. The COR thinks there are explicit opportunities in a central coordinating and facilitating role of the NWO-I Bureau in the field of education for PhD students. This can lead to quality enhancement and cost reduction. The COR recommends that - before all Implementation Regulations are harmonized - arrangements are made for the significant salary components in the CWI-Regulations. The COR also recommends to make sure that promised and earmarked funds stay available for the designated purposes. Click here for the news archive of the COR. If you wish to learn more about the activities of the Works Councils, or have any questions, please don't hesitate to contact your local representative or our professional secretary. Watch the new NWO Central Works Council film in which the council introduces itself.